Roasting the tomatoes and asparagus in balsamic vinegar adds to the natural sweetness brought out in cooking the vegetables. The sweet and tart bite from the vinegar makes the whole dish pop. 1Place the oven rack on the highest shelf. Turn the oven on to broil. 2Wash asparagus and tomatoes in cold water. 4In a large bowl, toss the vegetables with olive oil, balsamic vinegar, sea salt and freshly ground pepper. 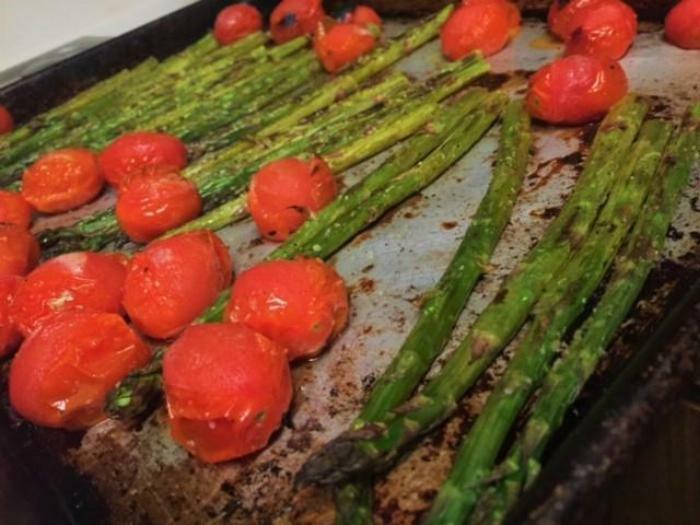 5Spread tomatoes and asparagus evenly on a sheet pan. 6Broil vegetables 7-8 minutes, until asparagus are just charred and tomatoes have started to pop. *Bend the root end of 1 spear of asparagus until it snaps. Line up all of the spears so the tips are even, and using the snapped spear as a ruler, slice off the tougher, root end of all of the asparagus spears.